Many Romanians are working tirelessly against the economic and cultural legacies of their Communist past, to build a better society and quality of life. 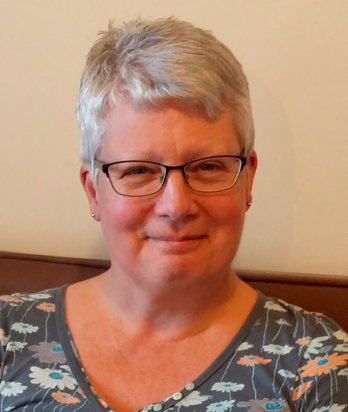 In 2013 I (Alison) was invited to be part of the team from Hilton Church, Inverness. The group were running a camp for children with disabilities and their parents/carers. This was to be the start of an ongoing journey of service and training for the teams that have gone out every year since. In 2016 I and my husband Andrew led a team of of 15 volunteers from the Barn Church, Inverness. 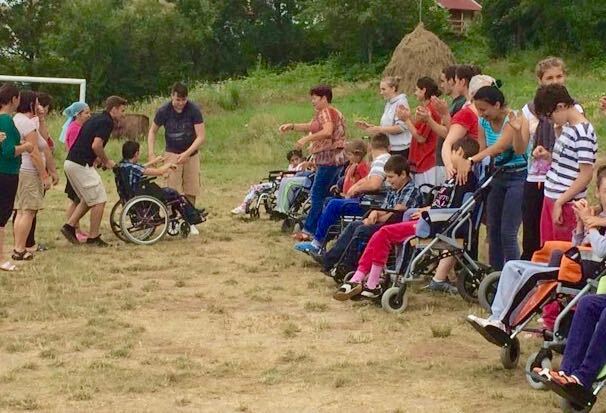 The Barn team ran the camp, mainly for children with Cerebral Palsy and their parents, alongside Romanian leaders and volunteers. A typical day started with devotions, then breakfast. 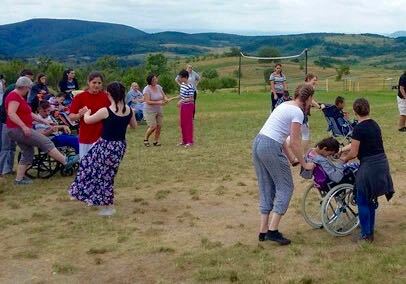 Then the programme of children's holiday club type activities started, this included interactive bible stories - building bricks upon their identity as children of God, singing, games, crafts and even wheelchair ceilidh dancing. At the same time the adults met together and had a time of support and discussion, finding out about the character of Father God and how he speaks to us today. This was an interesting time since the parents mostly attend the orthodox church in Romania. Many relationships have been built up over the years as families return year after year. There have been opportunities to share openly how we live out our faith in our day to day lives. We have been able to pray with the parents and children, which is very different to what they are used to. We see ing a growing openness for us to be able to minister to them, making a real difference in their lives. One mum was healed of a pain in her jaw & ear which came on all of a sudden and left after prayer, much to her amazement! I've gained so much encouragement and training through various ministries like Blue Flame, Healing on the Streets, Streams Ministries International and No More Crumbs Ministry. They have greatly encouraged me to go for the things of God and not to be afraid to step out with confidence. 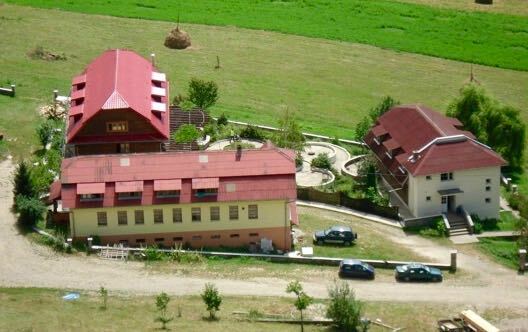 Casa Harului means House of Grace in Romanian and is a custom built camp centre, comprising of 3 volunteer built large chalets, 2 further small chalets and an owners house. It’s set in the stunning scenery of the foothills of the Romanian Carpathian Mountains. It also has it’s own sports field, play park and even a baptistery. Throughout the summer months, more than 1500 campers pass through the camp, in groups of up to 60 each week. A huge change from the 30 per week in tents nearly 2 decades ago when the story began. 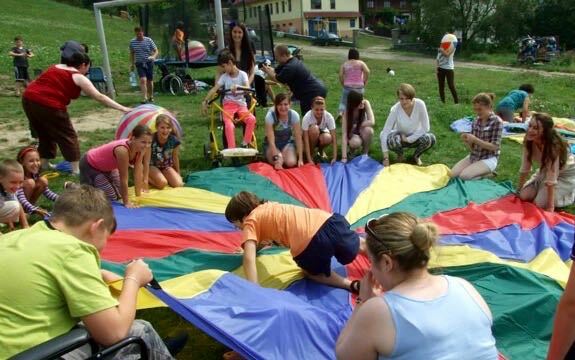 The centre began with the vision of Beni & Maria Medrea, who returned to Romania 20 years ago to provide holidays for children in poverty and adults with disabilities. It was also to provide holidays, respite and specialist education for children and families affected by disability in a country whose social and medical structures are considerably behind most western European standards.